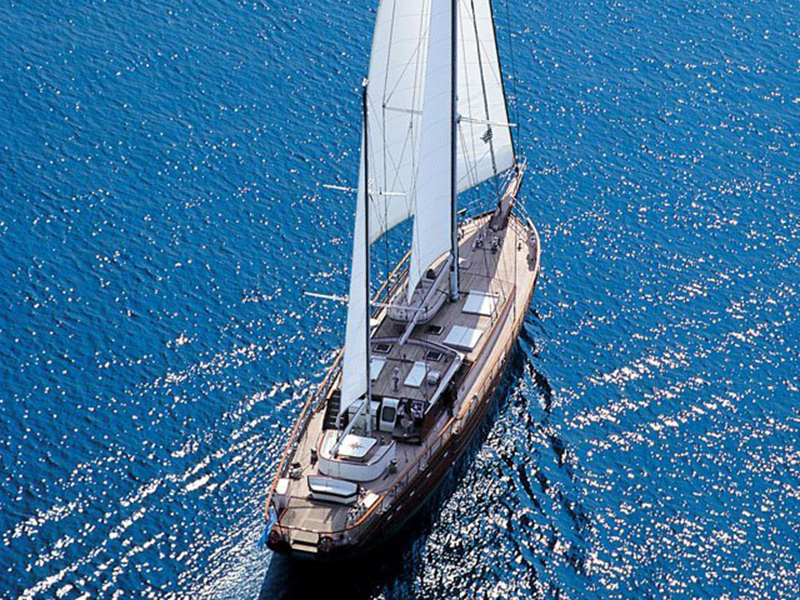 FUEL CONSUMPTION: extra 160 lt/k including gen.
S/Y Troia,112 ft. gulet sailing yacht, with the highest level of comfort and elegance without sacrificing sailing performance. 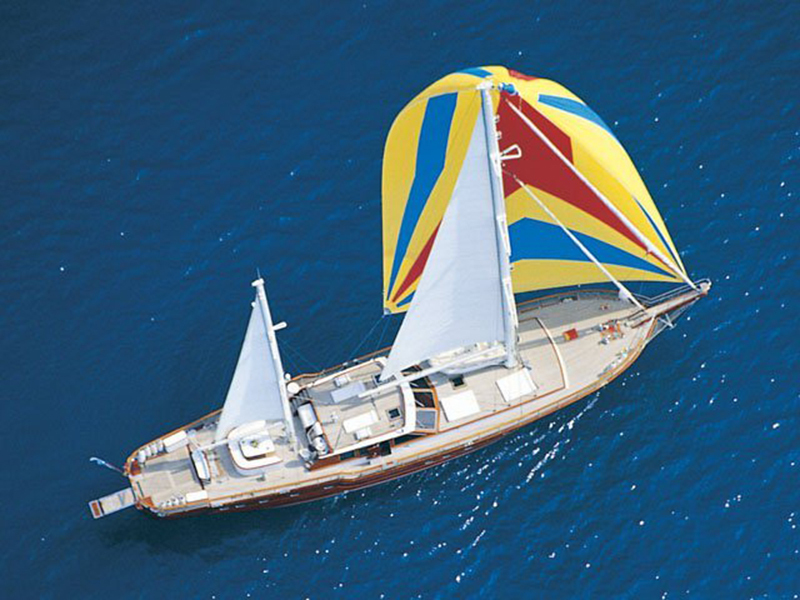 The self-furling sail system allows for effortless operation, by just the push of a button. This most impressive sailing yacht turns heads whenever she sails into port! 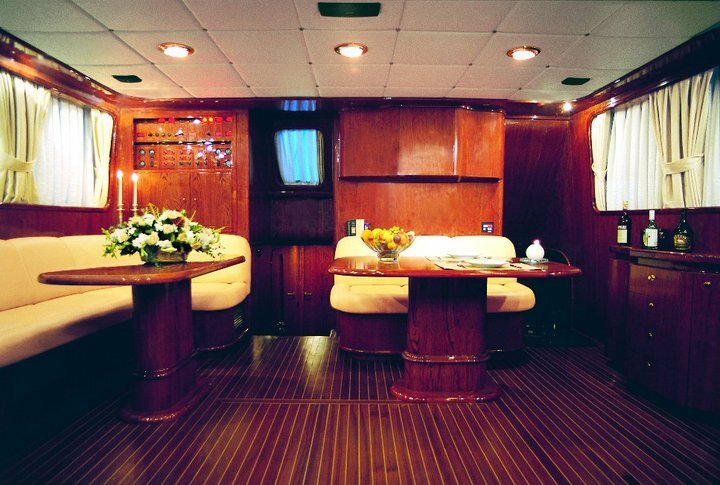 She accommodates up to 12 passengers in six luxury and spacious cabins. There are six112 cabins all with double beds and all staterooms have en suite baths. Her aft deck has a fantastic outdoor u-shaped table, which is perfect for el fresco dining, or dining can take place in her saloon/dining room with windows all around offering panoramic views. She is staffed by a crew of three. 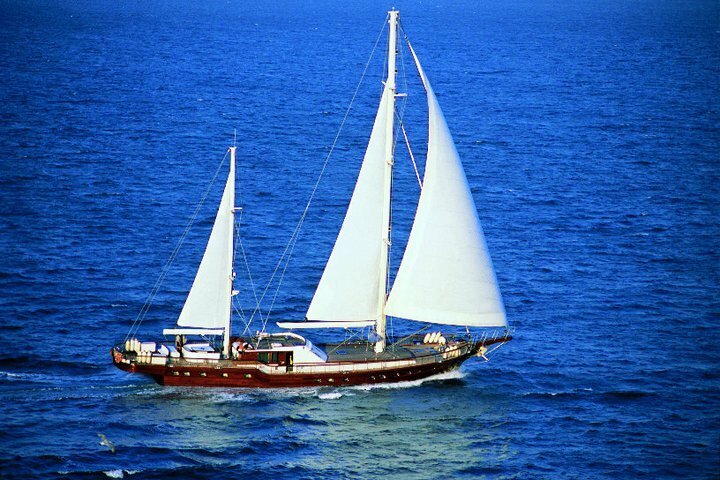 Motor sailer Troia is a traditional yacht in Greece that can sail in total comfort under any weather. Her elegance and excellent sailing performance together with so many luxury amenities provided make her a unique yacht in her kind. Her interior is one of the highest quality workmanship and wood offering a relaxing and luxurious atmosphere. A wide array of water sports are provided on board. Outside steering enables controlling the navigation and sails by one single button. Beautiful and stylish will offer to her guests the ability to relax or dine without loosing touch with the outside environment. All cabins offer a fridge, a cd-player, a safe and air conditioning for comfortable and relaxed living. 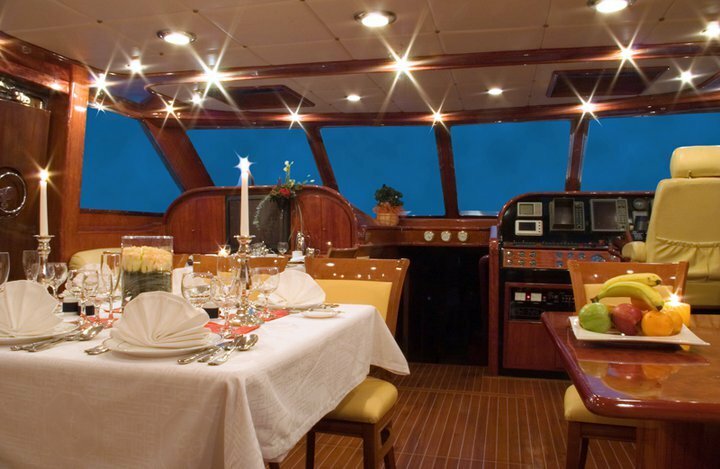 A friendly and professional crew of 5 members will offer exquisite services on board. 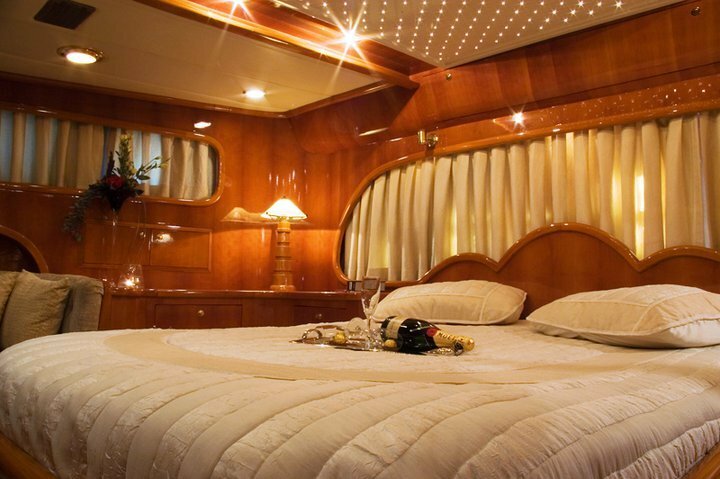 5 queen cabins with ensuite bathrooms. Hifi Audio, LCD TV', Radio, CD-MP3 Player, iPod Hookups, WiFi Internet, Bimini, canoe/kayak, board games, Windsurfer, Water Skis Kids, Water Skis Adult, Kayaks (2 Pax), Satellite TV Video, DVD in saloon, zodiac 4,7m with 70hp outboard, tender 2,8m with 10hp outboard. Water-skis. Banana. Tubes. Fishing equipment. Snorkelling gear. Every cabin is equipped with fridge, CD-player and I-pod connection, safe and individual air-conditioning controls. 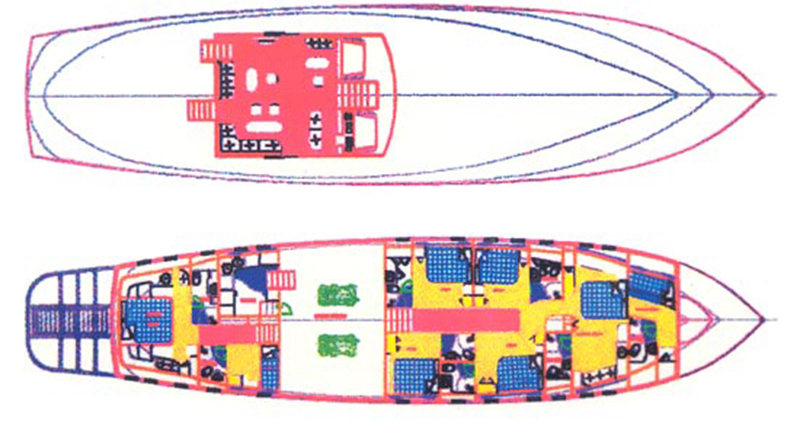 All cabins and salon have their own independent air-condition, One Refrigerator, One Freezer, Complete set of sails.